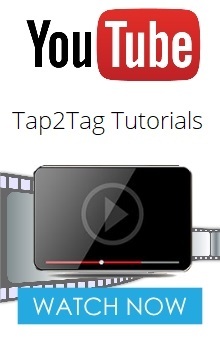 Q How is Tap2Tag different from other products and services? Each Tap2Tag Medical profile that is attached to a Tap2Tag Medical device can typically display more information than our competitors. Fields such as allergies, medications, blood type and emergency contacts can all be added to your Tap2Tag Medical profiles at no additional costs. Our medical forms can also be quickly amended online at any time by you to account for any changes in your medical prescriptions or conditions. Once your profile is updated it is automatically applied to any of your Tap2Tag Medical devices that you have assigned your medical profile to. Additionally our system will allow you to restrict what information is available to responders giving individuals peace of mind knowing that possibly sensitive information cannot be obtained by just anyone. Finally our system will also automatically notify your ICE (In Case of Emergency) contacts by email and/or text message if somebody has tapped your Tap2Tag Medical device. Q Do I need to know my blood group? A We have included a place for you to add your blood group on the medical profile. However many people do not know their own blood group and it is difficult to get this information from your GP unless you have a blood test or you are a blood donor. However this is not vitally important information in the UK as A&E departments will cross match your blood if you need a blood transfusion. If you do not know your blood group then just select "Not known" from the drop down menu. Q What type of documents can I load into my medical profile? You can only upload single PDF documents into your medical profile. PDF's are probably the most secure type of document and cannot be easily edited once they have been loaded. You can upload other documents but you will need to select a new document within the medical profile to do this.